Iravatham Mahadevan, a multi-faceted personality died at the age of 88 in November 2018. He was an IAS officer and after his retirement edited the popular Dinamani newspaper for a few years. But he is known for his contributions to two major areas of research. He was the pioneer in reading early Tamil inscriptions in the Brahmi script. His magnum opus, ‘Early Tamil Epigraphy’ puts together all the known Brahmi Tamil epigraphs in one place and establishes the methodology to be followed in interpreting them. Equally important is his work in the field of interpreting the Indus seals. Starting from building a complete concordance of all the known symbols of the Indus seals, Iravatham Mahadevan went about unravelling what those symbols meant. To this day no one has successfully deciphered the Indus symbols, but Iravatham Mahadevan’s work may go a long way in helping the researchers. 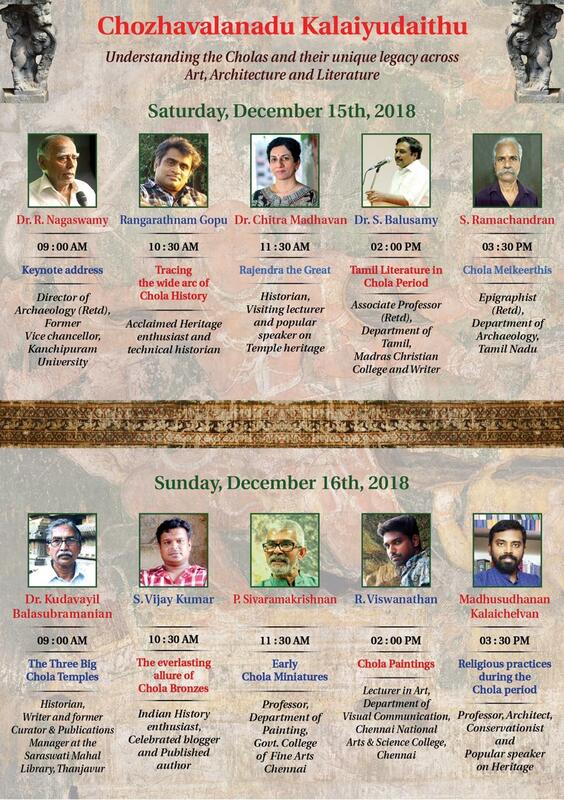 The talk will cover the two major areas of Mahadevan’s research, Tamil epigraphy and Indus decipherment. In addition to describing the work done by Mahadevan, the talk will try to unravel Mahadevan’s research methodology. MV Bhaskar is a CEO of a Chennai based AuthorCafe. His passion is in the space of conservation and documentation of art. He worked as a consultant and archivist for creating a digital archive of the murals of temples in Tamil Nadu. He had also worked as the Project Director for constructing a curated archive of all the Tamil Brahmi inscriptions identified and included by Iravatham Mahadevan in his book. In the process, he started working closely with Mahadevan and collaborated with him on a series of papers on the Indus script. He is the editor of the ‘Collected Papers on the Indus Script’ by Iravatham Mahadevan, a forthcoming publication. MV Bhaskar had presented a talk on “Preservation and Documentation of Temple Murals” for the Tamil Heritage Trust, in September 2012. Entry for the event is absolutely FREE; No registration required. The event will also be available on LIVE. 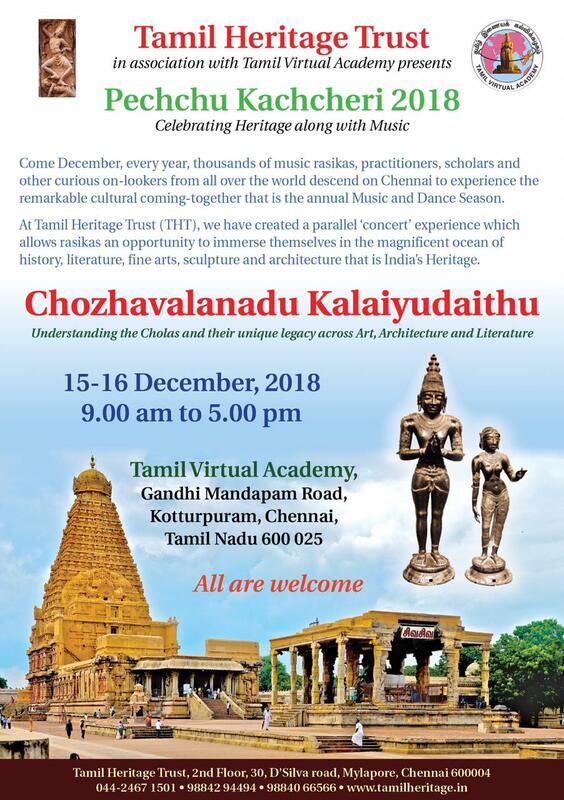 For further details, please visit http://www.tamilheritage.in & https://www.facebook.com/TamilHeritageTrust. An accountant by profession, Prathik is also pursuing his masters in Historical studies from the Madras University. He contributes his writings to heritage magazines and is passionate about heritage travel. Indian cultural anthropology is close to his heart, hence he displays ardor to present his views through talks. Inscriptions stones (Shila Shaasanas) in the Bengaluru area are original documentation of the people of that region, their culture, religion, and language. These stones conjure up vivid pictures of the historic and social fabric of the past, with linguistic plurality, construction of lakes, tax practices, donations, grants, governance et al making up their warp and weft. Rampant urbanization in Bengaluru has led to the destruction of a majority of the 150 stones in the old ‘Bangalore’ region, painstakingly documented by B.L. Rice and others between 1894 and 1905 and captured remarkably in the twelve-volume ‘Epigraphia Carnatica’ series. The talk will focus on “Inscription Stones Of Bangalore” (Facebook: https://www.facebook.com/groups/inscriptionstones & Twitter: @inscriptionblr) a citizen activism project to raise awareness and protect ancient inscription stones found in the Bengaluru region. The project has been using technology (social media, mapping, 3D scanning, 3D printing, OCR) to protect preserve & restore the dignity of the last few remaining ‘Inscription Stones Of Bangalore’. One of its passionately ambitious projects is to build a Mandapa designed in ‘Ganga’ style to house the oldest known inscription of Bengaluru, dating back to 750 CE, the “Kittiah Veeragallu” (Kittiah Herostone) of Hebbal, through crowd-funding from all strata of the society including the local community, a path-breaking attempt in responsible heritage activism. Udaya is a passionate Bangalorean and an accidental historian-conservationist. He has a Master’s degree in Engineering Mechanics from IIT Madras and has earlier worked in various capacities for the Tatas and General Electric. He currently heads the Software Delivery Centre, India at Schneider Electric, delivering industrial automation solutions to clients worldwide.